Indirect filling used to replace a larger portion of a tooth including a tooth’s cusp. It can be made of different materials such as gold, composite and porcelain. The process of making an onlay is the same as with the inlay. The only difference between the onlay and inlay is that the onlay restores a larger part of the tooth. Dental onlays are used when the tooth is very damaged and can’t be restored with a filing. In a lot of cases, these teeth are too weak to be covered with a crown or treated with a filling. Onlays provide a great support and are a very good solution for these types of teeth. Dental onlays are very similar to inlays. 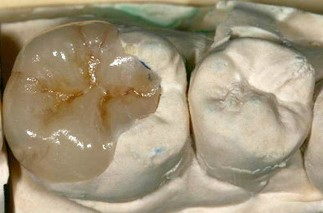 The two restorations are done in the same way, the only difference is the surface of the tooth they cover. Dental inlays are meant for damaged teeth, but with present cusps. In other words, inlays are placed in the area between the cusps, in the center of the occlusal surface. Dental onlays take up a larger portion of the tooth and can cover one or more cusps. In some cases, they even cover the whole occlusal surface. Onlays can be made of several materials, including gold, composite and porcelain. Gold is a great material for onlays, but because of the bad aesthetics patients decide to go with another one. Porcelain is the material they use in most cases. It is very durable, tooth-colored and provides great results. Composite materials are softer compared to porcelain, so that is why they are less used. The procedure starts with the removal of all decayed tissue and leaving a clean cavity. A lot of patients prefer to get this procedure done with anesthesia. Once the dentist is done with removing the decay, they will take an impression of the tooth. That impression is sent to the dental lab, where technicians make the onlay. It might take a while for the restoration to be done, so in the meantime, the patient has a temporary filling. Once the onlay is done, dentists use special materials to cement it. This is the indirect way of making an onlay. The direct way is done in the office and with composite. Dentists prefer the indirect option. The third way to get an onlay is the CEREC method, that provides a high-quality restoration in only one visit. The biggest advantage of onlays is that they are very durable. They really protect the tooth, thanks to the procedure and materials used. These are very precise restorations. If an onlay is done properly it can last for more than 20 years. So this is a long-term investment. Dental onlays are more expensive than fillings. A lot of patients simply can’t afford to get this type of treatment. Another thing is that they require two visits to the dentist. During the first one they will only get an impression, while the second time, the onlay is ready. If you decide to get an onlay with the CAD/CAM method, the restoration is done in only one visit.